Cell Phones. iPods. iPads. Batteries.....they all need to be charged. We've come across some clever ideas that help wrangle those unruly cords but, to be honest, most of the options are just plain ugly. Of course the idea of concealing the cords is just wicked good....but then wrap it all up in a great retro Samsonite train case. Book it. We've added a custom cut peg board to thread each cord through & to hide the power strip beneath. 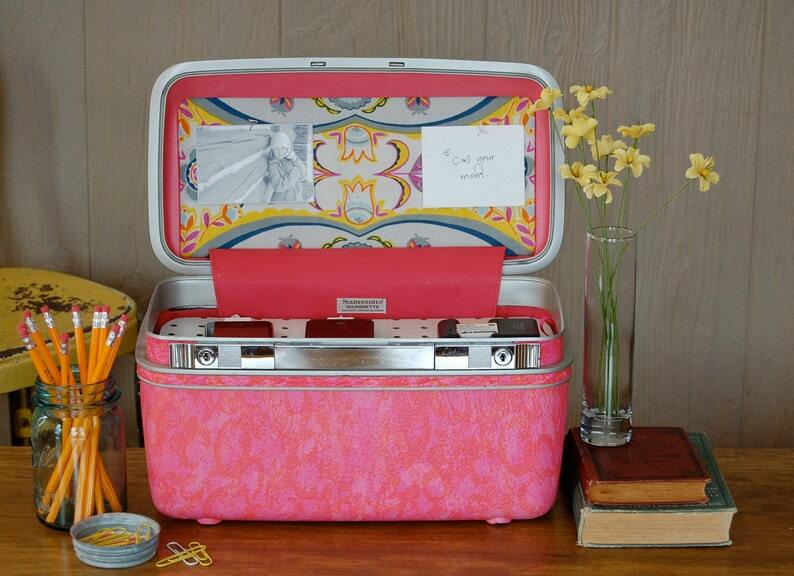 On the inside of the lid, we fit a fabric covered tack board to hang notes & photos. Finally the cord opening is finished off with a grommet. If you'd like a key, just let us know. We've found that some cases are difficult to come by but we're confident we can source one to suit your needs. A few colors are rare and a bit more expensive. Within the cost of the $98 is a budget of $25 - $30 for the case itself. If the case you want is above that budget, we would simply invoice you for the additional. We'll work with you to choose a tack board fabric to your liking. We are happy to combine shipping. Just email us and we can get you on the road to brown paper and twine in a snap. Likewise, if you are looking to gift your favorite someone……let us know, we’d be happy to ship your item gift wrapped directly to save you a step. I have been looking for a functional AND attractive charging station solution for *years. * This was perfect! Sara and Stacy were super communicative - quick to answer questions and design exactly what I wanted and then ship it super fast! I could not be happier with the end result.